Temporary independent senator and youth advocate, Nikoli Edwards, says that the act of child marriage is a form of slavery as it often involves marriage between a child and an individual much older than them. 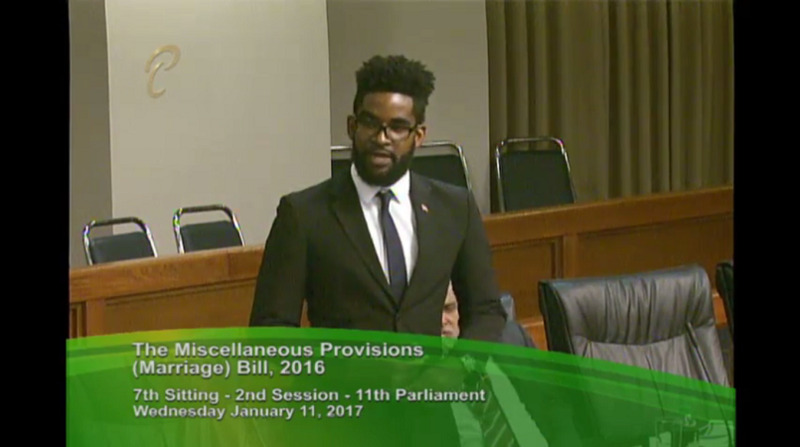 Speaking in the Parliament on Wednesday regarding The Miscellaneous Provisions (Marriage) Bill 2016, Edwards, 25, who is the country’s youngest senator to date, said it is a violation of the rights of a child to place them, as husband or wife, in charge of a household before they have learned to be adults. Further, he chastised Opposition Senator Rodger Samuels for judging young people without allowing them to be heard. He said child marriage prevents children from pursuing education and attaining their true potential. Edwards also slammed comments by Opposition Senator Rodger Samuel who said young people are ‘following the devil’. Opposition senator Rodger Samuel argued that raising the marriage age as a reflection of maturity is questionable given the rising divorce rate, showing that some individuals may be older, but not more mature. “How do we level the field? How do we rate the level of maturity? What is suitable when it comes to the age limit? There are also serious issues with marriages over a certain age…the numbers in (the rate of) divorce is ridiculous,” he said, citing a newspaper article highlighting a rise in divorce cases since 2012. "I hear people say at 18 people are responsible, who says that? Where's the justification?" Samuel said in order to properly discuss these factors, the issue should be referred to a Joint Select Committee (JSC) for discussion. The Matrimonial Proceedings and Property Act Chapter 45:51. The Bill also seeks to harmonize the aforementioned marriage statutes across the board by raising the legal age of marriage to eighteen years; repealing any parental consent for a marriage; creating an offence where it is illegal to solemnise a marriage of a person who is under the age of eighteen years, and extending the hours in which a marriage can be solemnized.